When, not if, the Royals clinch the AL Central division, the postseason gear that will be worn by the likes of Hosmer, Cain, Gordon and others during the celebration will be released to awaiting fans at the K and licensed retailers across the metro, including Rally House and Academy Sports locations. 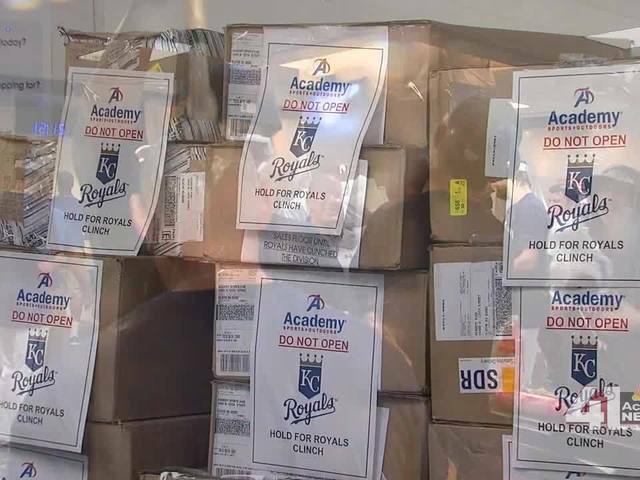 Rally House plans to stay open until midnight on the night the Royals snag the division, while Academy Sports locations in Olathe, Overland Park, Belton and Topeka will reopen and stay open until the playoff gear is gone or all customers leave. The design of the postseason gear is a closely guarded secret by MLB. They have ordered licensed stores to not open, display or put gear on the shelves until the Royals officially seal the division deal. Academy Sports Olathe store director Brenda Kennett said she expects the gear to fly off the racks. "I can't go into specifics, but I'll tell you that people are going to love it,” said Kennett. “It's very clean, simple. Honestly, it brags about the Royals, so who's not going to want it?" Brian Abel can be reached at brian.abel@kshb.com .